About me and birding in Turkey! There is that thing about birdwatching. 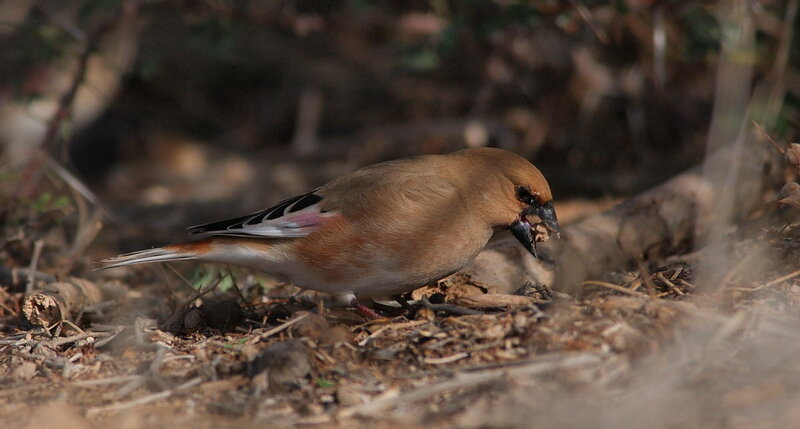 Even after a trip to Israel the hunger for birding just keeps coming back after a while. So I went out for a short trip to Mogan Gölü. It is still cold in Ankara. It freezes most nights so only the larger water bodies are ice-free. 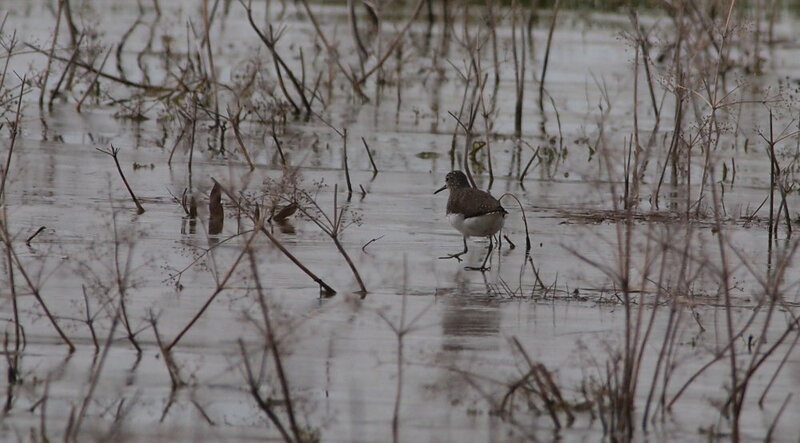 But despite the cold weather spring is at hand and the first migrants have appeared. I haven’t seen White Wagtails for a few months but today about 10 of them were present. The first Stonechat of the year was also a nice surprise. The large flocks of larks have been gone but today a flock of about 500 larks were present. Most of them were Skylarks, but there were also a few Calandra Larks in the flock. A flock of about 400 Ruddy Shelducks always gives a little warmth of a cold day. A flock of 20 Ruff, 7 Green Sandpipers, 12 Common Snipes and a few hundred Lapwings were also around. 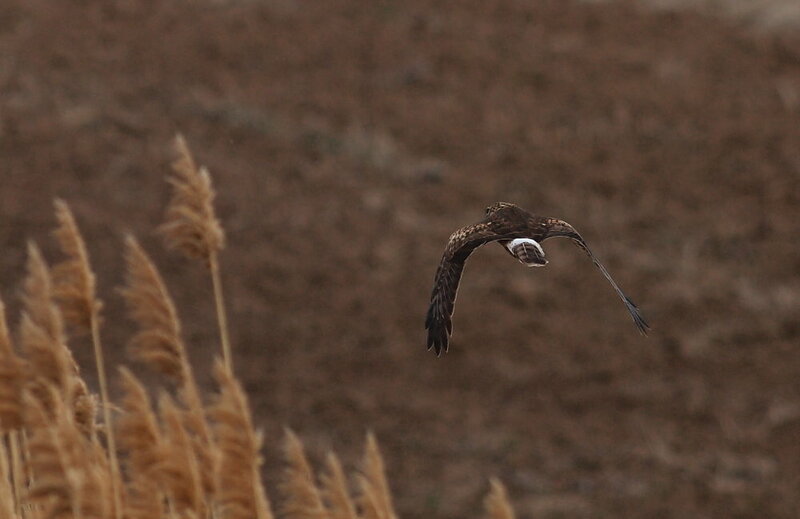 Only 3 Marsh Harriers, 2 Hen Harriers, 1 Common Buzzard and two Long-legged Buzzards were a little disappointing. 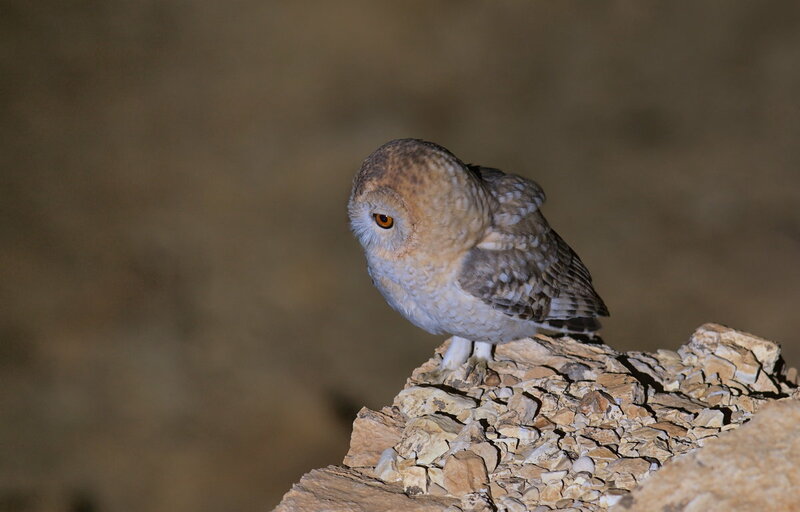 But in a few months there will be Lesser Kestrels and good numbers of Red-footed Falcons around – so it’s ok.
After the Hume’s Owl experience we stayed one more night with Oded in Neot HaKikkare. After a good nights sleep we went birding in the Hatzeva area. We checked the Syrian Serins again and this time the birds gave much better views in perfect sunlight. Compared to yesterdays poor views it was almost like getting it as a lifer again. 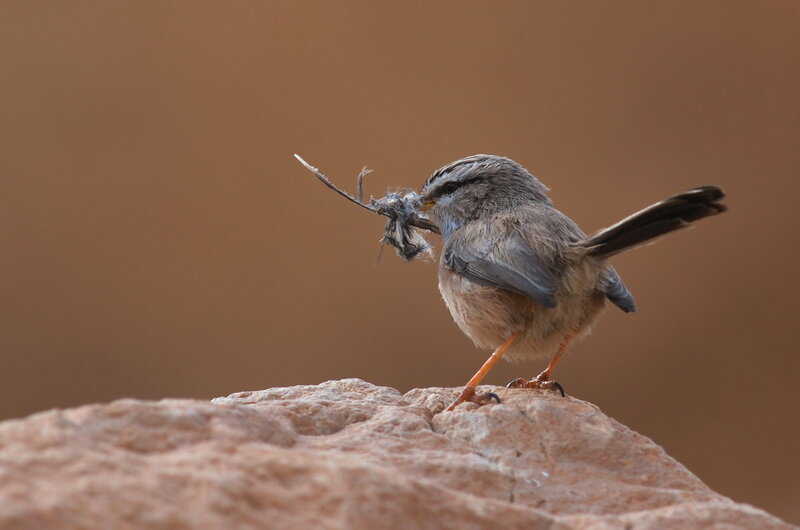 Oded has made studies of both Southern Grey Shrike and Arabian Babblers behavior. So some birds around Hatzeva have become rather tame. 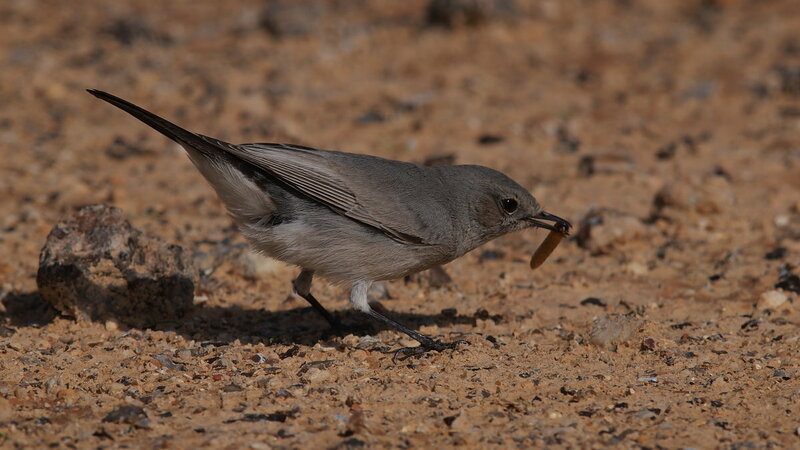 For instance a Blackstart has been fed with worms every now and then. So Oded gave us some worms and we went to the Blackstart-place. And we soon located the bird – and when it found out that we had worms it went crazy walking less than a meter away from us. Truly stunning! After finishing birding in Hatzeva we went to the Judean Desert in order to see the Striolated Bunting, but again we didn’t have any luck. The only addition to the trip-list was a Berbery Falcon. Yoav had invited us to dinner before flying back to Turkey very early in the morning. On the way to Yoav we passed Lahav, where Emin saw Long-billed Pipit on our first day of birding. So we checked in once again. 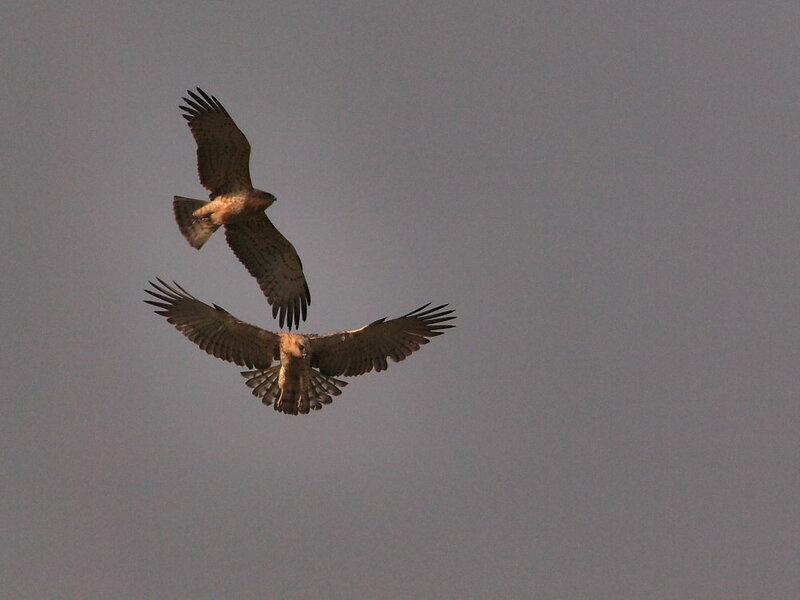 The first birds we noted were two Short-toed Snake-Eagles, that were hunting in the hills. After enjoying them for a while I started walking in the are and soon I got confused as I thought I heard the Long-billed Pipits, but their calls were mixed with Crested Larks and Skylarks. I went to check the sound and suddenly I flushed two Crested Larks, one Skylark and two LONG-BILLED PIPITS. Yes, finally I managed to see them. They are not exactly shy birds, so I managed to get a few pictures, even though they’re nothing to brag about. After Lahav we went to Yoav, where we spent the evening in the company of him, his wife and their two boys. 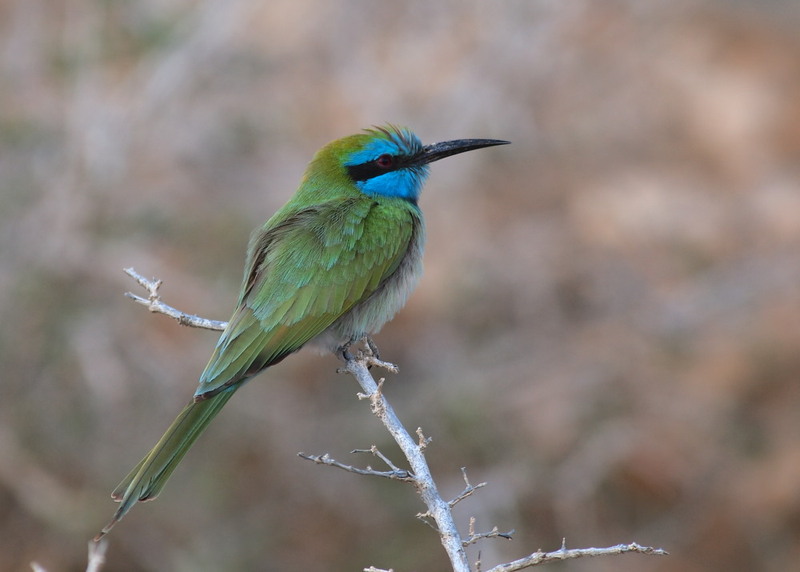 And at 01:00 we headed towards the airport – a very good birding trip to Israel had come to an end. Surely I’ll be back to this wonderful country. At last I really wish to say thanks to Shachar Altenman, Amir ben Dov, Yoav Perlman, Jonathan Meyrav, Hadoram Shirihai, Itai Shanni and Oded Keynan for all their help with planning and carrying thou this trip. 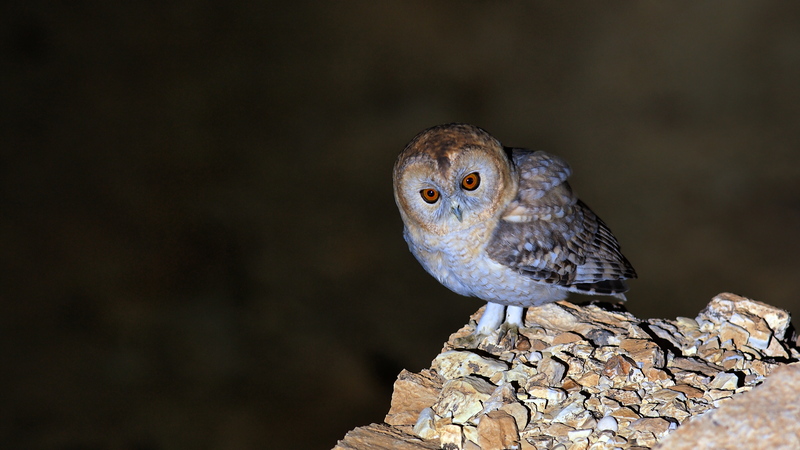 Oded Keynan invited us to stay with him and his family after showing us the superb Nubian Nightjars. We accepted the invitation of course. In the evening he gave us a bunch of information about the area we were in. So we got up early and headed out to the field. 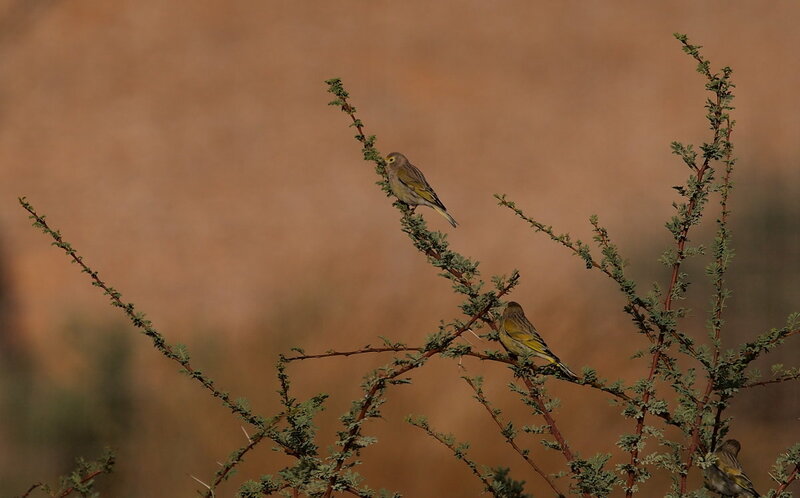 First we stopped at a point, where Oded had seen Syrian Serins the day before. 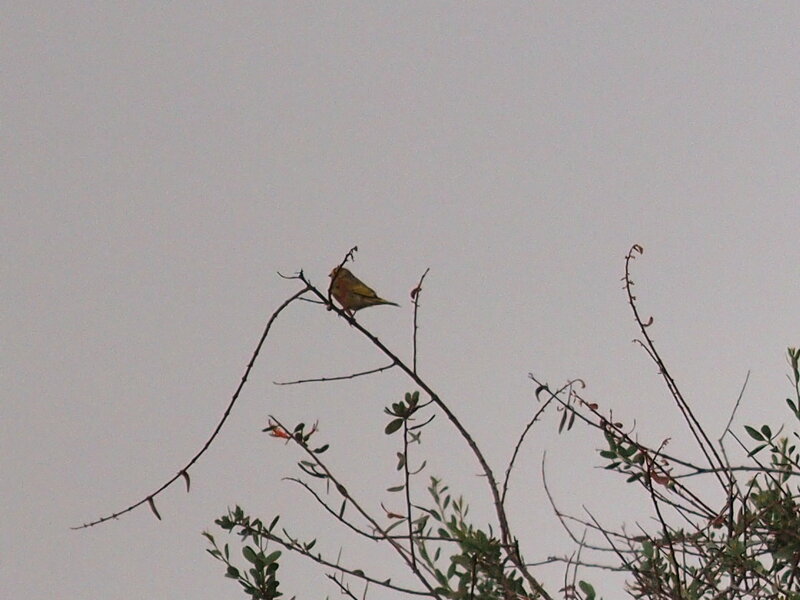 Unfortunately it started to rain, but when the rain stopped Emin located 8 Syrian Serins in a tree. They flew away almost right after discovering them, but we did get some photos just to document them. 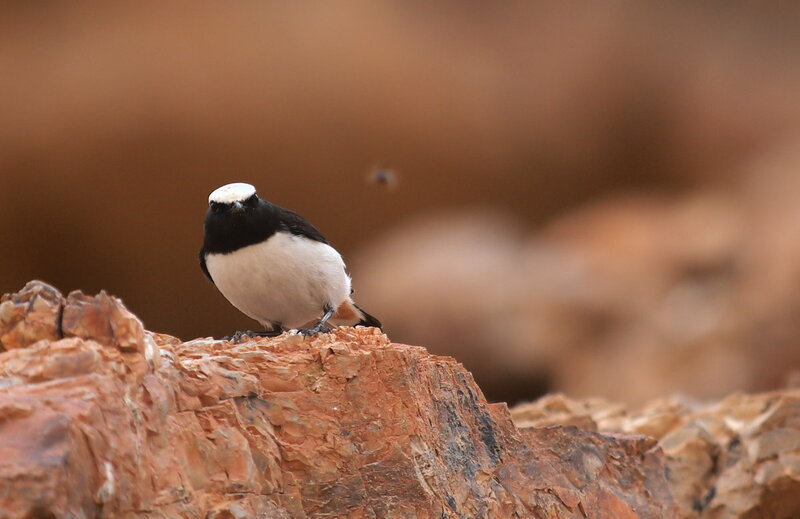 White-crowned Wheatears – adult and 1st year bird together. 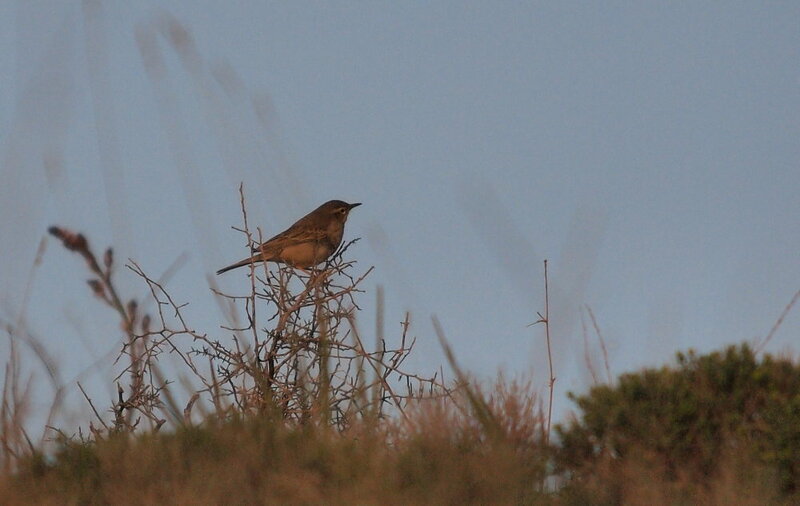 In the same area we also saw Desert Finches, Scrub Warblers and Sardinian Warblers. 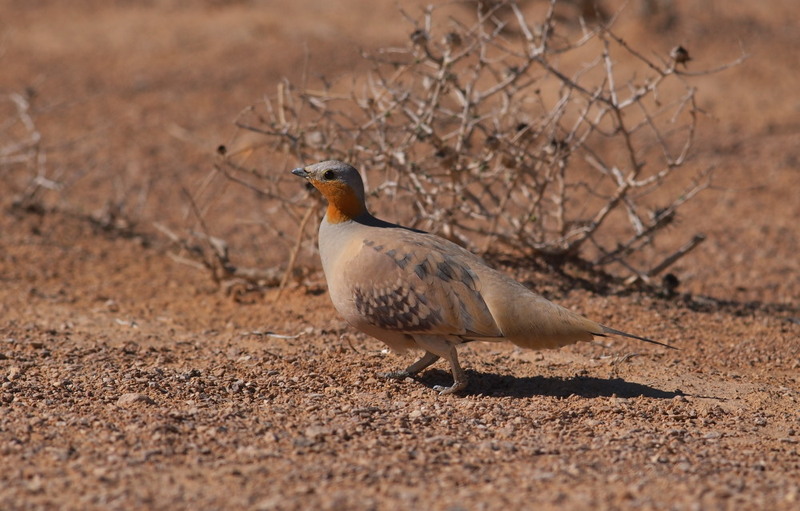 Yoav Perlman called in the morning and said that he would join us for some birding in the Judean Desert. 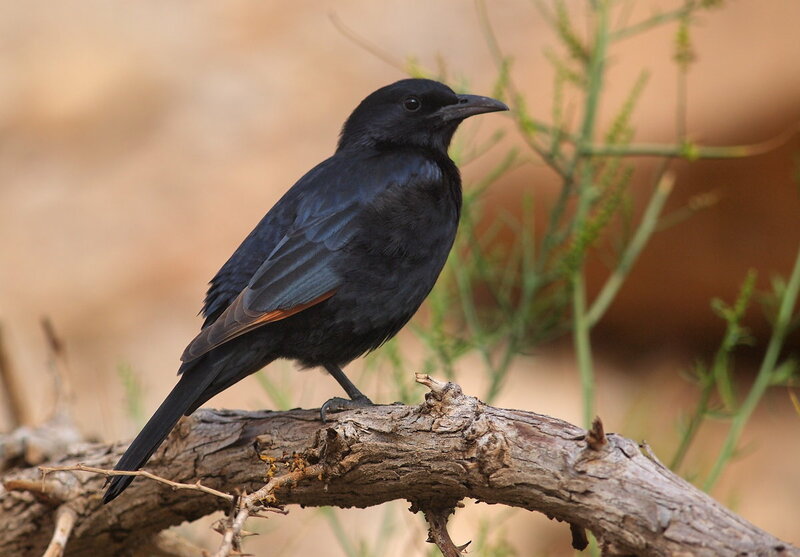 Our targets were Tristams Grackle, Fan-tailed Raven, Striolated Bunting and Cyprus Warbler. Tristams Grackle and the Fan-tailed Ravens we found even before we reached the area, but the last two were more difficult. We only heard Striolated Bunting sing for a while above the valley where we were birding, but we couldn’t locate the bird. 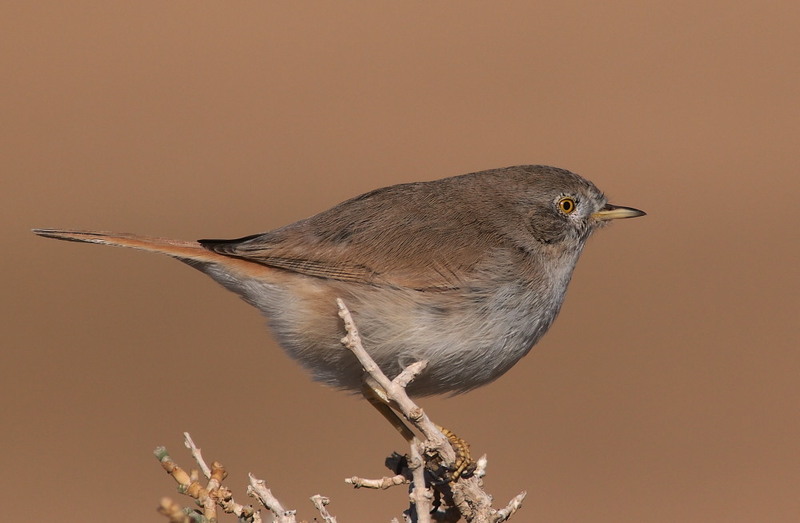 And a Cyprus Warbler was flushed a few times, but did not give any satisfying views at all. Yoav had to leave in the afternoon, but we continued birding for a while. Good birds included Scrub Warbler, 5 Griffon Vultures, Hen Harrier (weird to see in the desert), 20+ Sinai Rosefinches, Sardinian Warblers, male Hooded Wheatear and Palestine Sunbirds. We then decided to check another valley around the Dead Sea where we stayed at a public camping ground untill dusk. And suddenly we heard an owl, two owls, three owls – and they were Hume’s Owls! 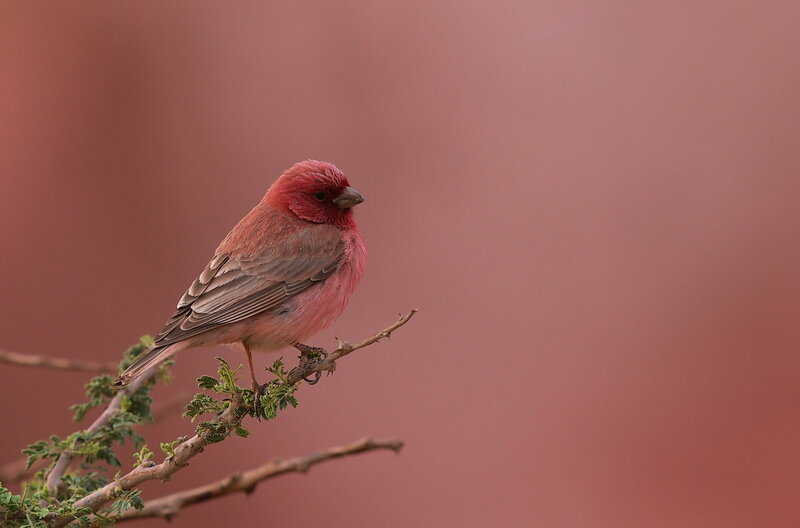 Wow… a dream bird for us! Hume’s Owl – click to enlarge! This time of year might be the best time of year to observe Hume’s Owls as they are very vocal as they protect their territory. Furthermore they are very curious birds. 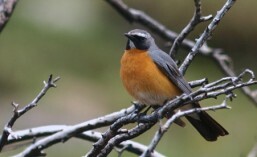 Especially one of the birds came very close to us several times – down to a distance of less than 8 meters. Truly stunning in deed! And we even managed to get photos! 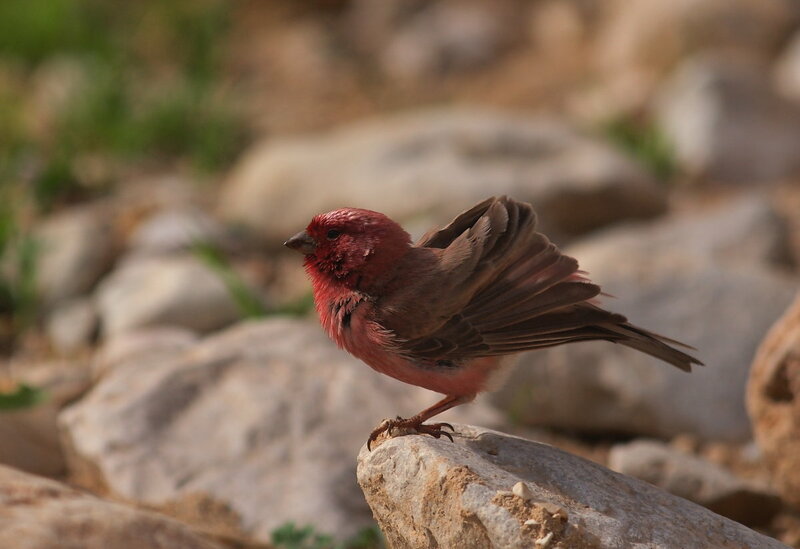 We got up early today as our morning target was Sinai Rosefinch. It can be seen in desert mountains, but there are a few places where it is easier to be found. Itai had told us of such a place just north of Eilat. And finally there was an easy bird after all the difficult ones. 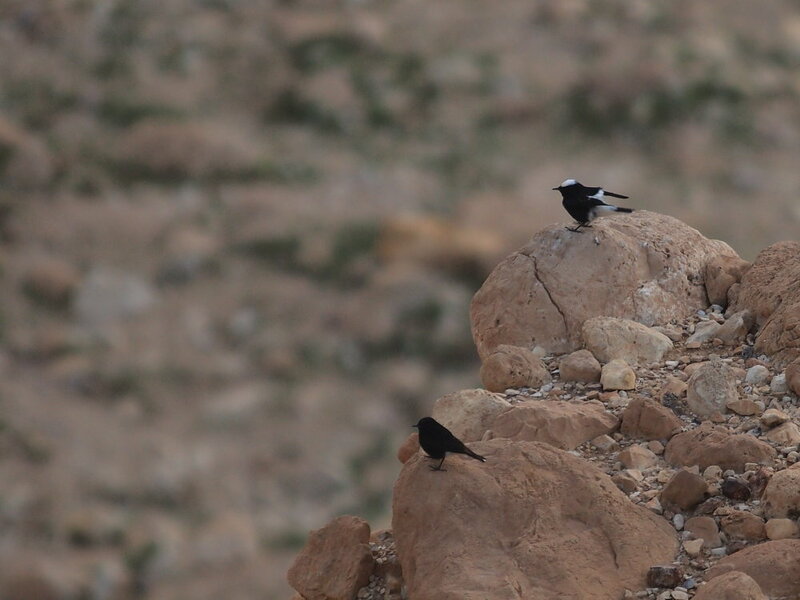 After a short while in a wadi just north of Eilat we found a male and a female that gave very good views for a long period. 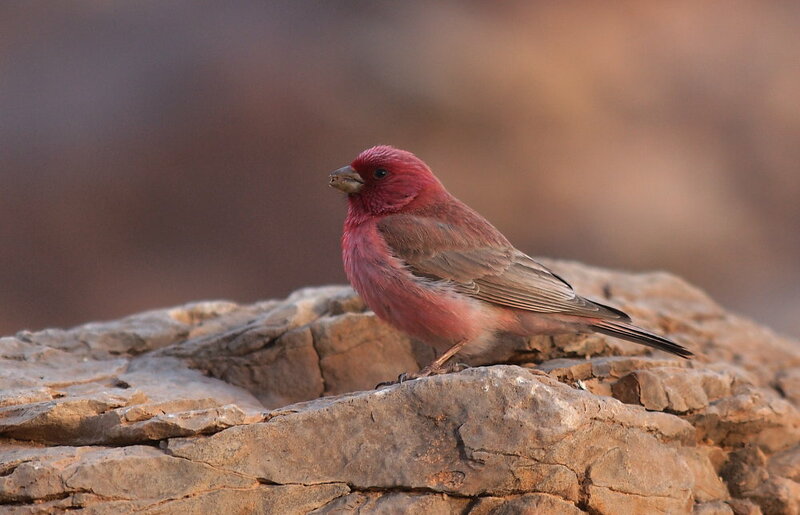 But we didn’t use much time with the Sinai Rosefinches as we wanted to go to Uvda Valley to search for larks and other stuff. We came to the area a while later. It is quite a big area, so there are many hiding places for larks. 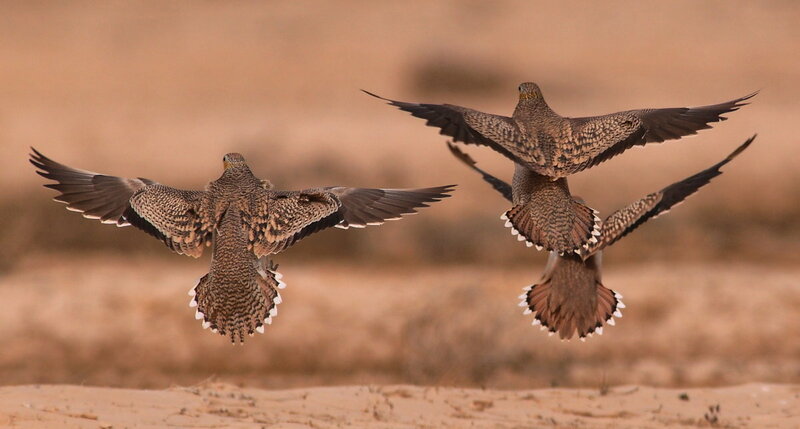 We walked, checked, looked, searched – but we couldn’t find any of our target larks. But that didn’t mean that there were no birds around. About 50 Trumpeter Finches, several Desert Wheatears, three Isabelline Wheatears and a steady flow of migrating Steppe Eagles made the birding quite good. After a while I came across our first Mourning Wheatear and an hour later we had found three different birds. 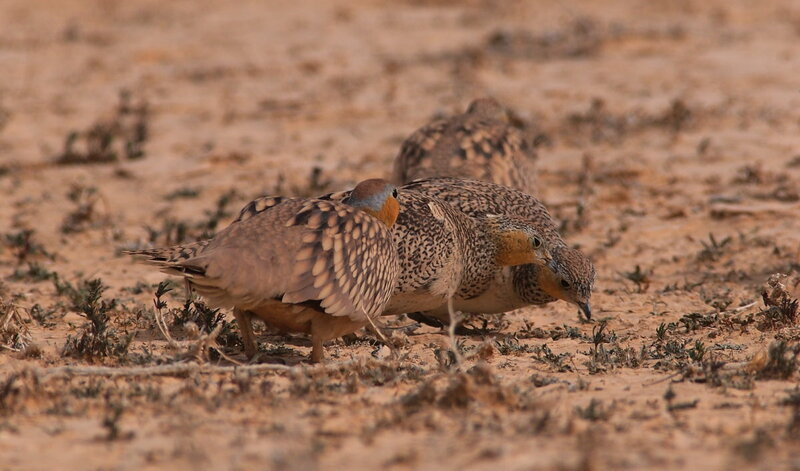 But the highlight in Udva were a flock of about 10 Crowned Sandgrouses, that were not shy at all. As long as we stayed in the car they came within 10 meters distance of it. Quite a way to get a lifer. We decided to go north to the Judean Desert. 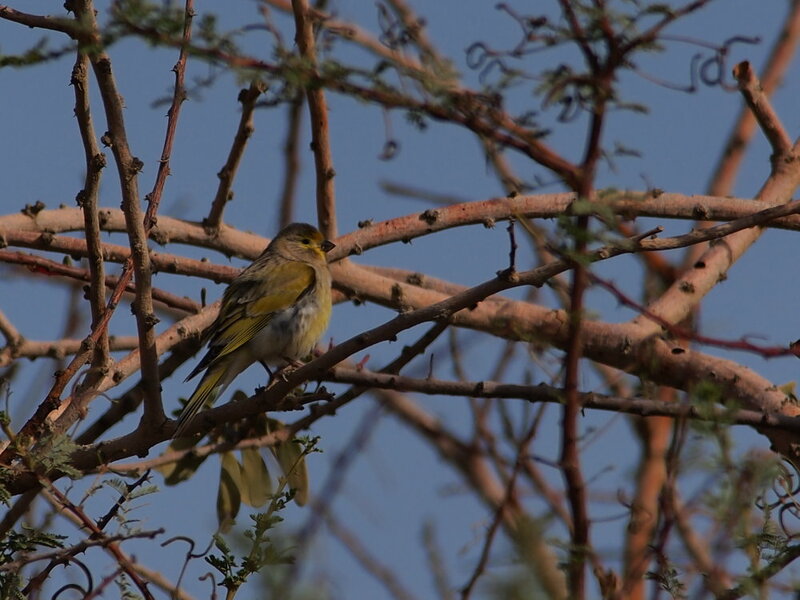 On the way there we stopped at K152, where we saw three more Arabian Warblers and finally we also saw a Scrub Warbler. We then headed to Ne’ot Hakikkar. 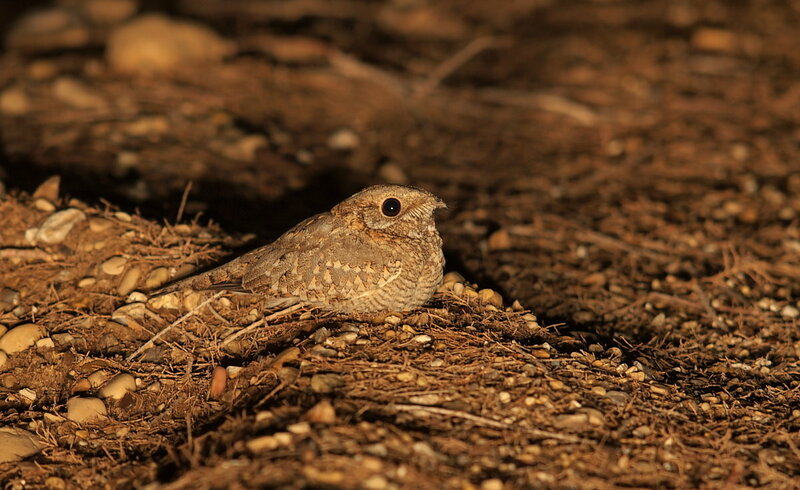 Oded Keynan – a local birder – had promised us to take us on a “nubian nightjar” trip even though it is the worst time of year to go and look for them. So we didn’t really expect to see them. 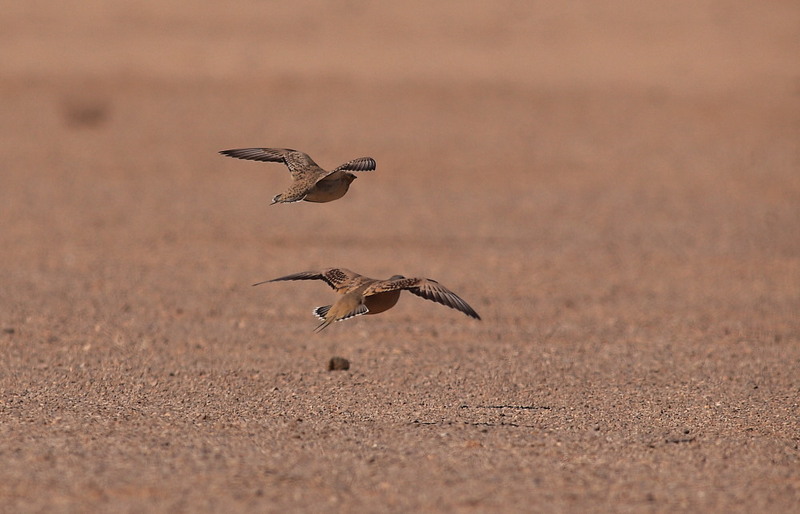 But we came to the area and five minutes later we saw our first Nubian Nightjar flying around the car – amazing. 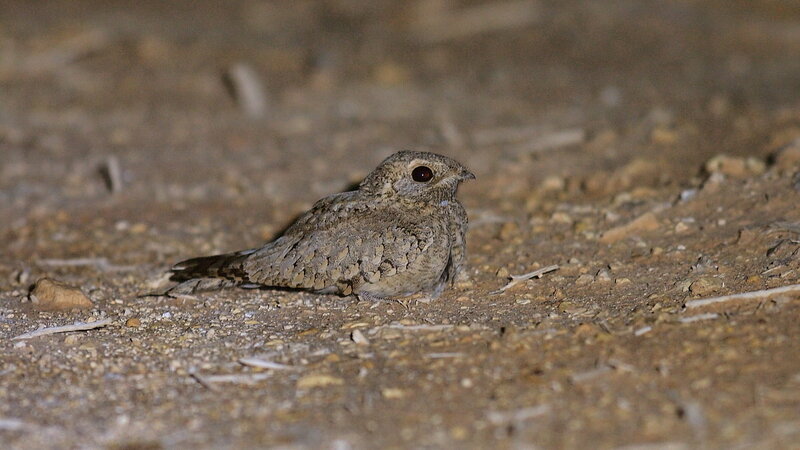 Nubian Nightjar of the subspecies ssp tamaricis is very rare. 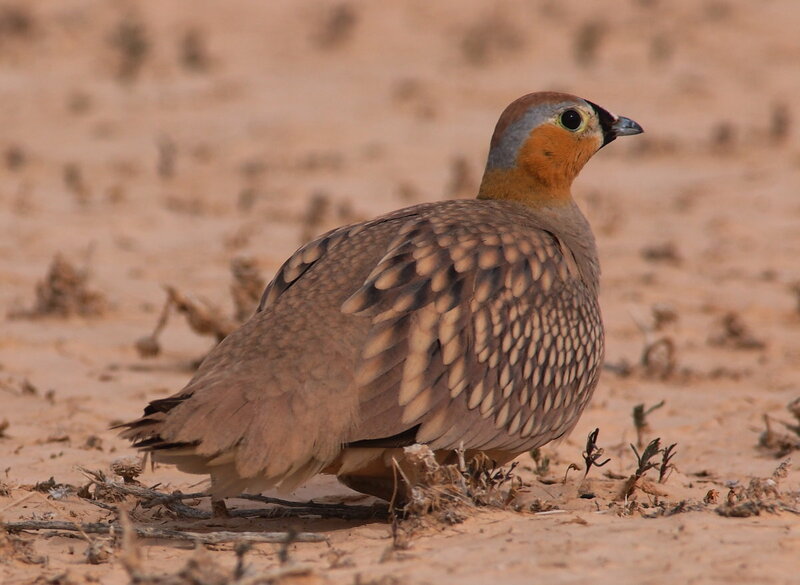 There are about 20 pairs breeding in Israel and a few more in Jordan and maybe a few other places. 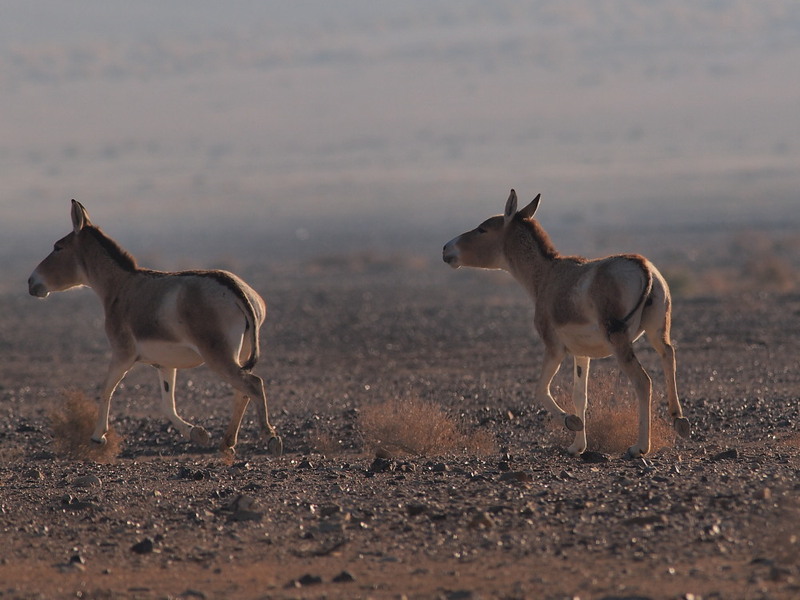 But in Jordan their habitat is under severe pressure and it might be a question of time before they’re extinct there. 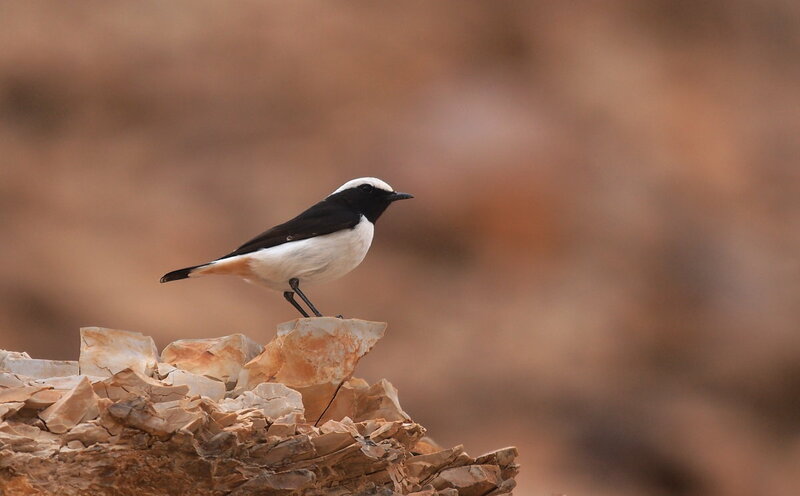 Luckily at least their main breeding area in Israel – Ne’ot Hakikkare – has just been turned into a Nature Reserve. So hopefully they birds will not be extinct. It is alway challenging with night-photos, because the birds/the photos colours are determained by the light in the torches. So just check the difference. 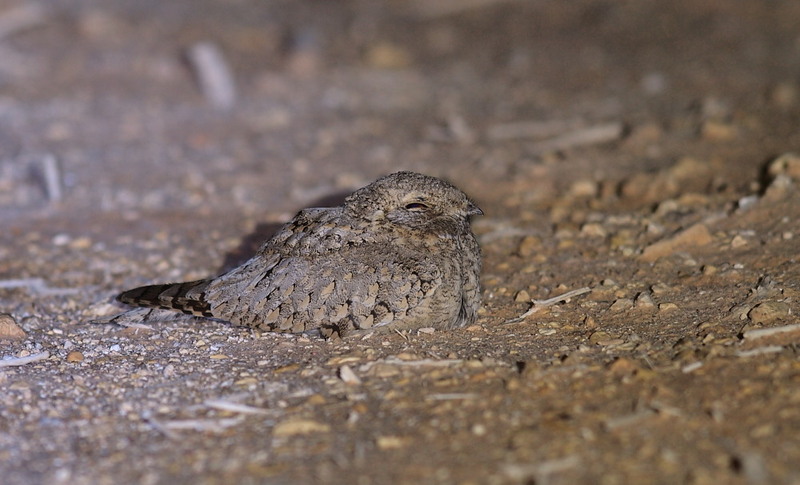 Nubian Nightjar – in blue light. Click to enlarge. 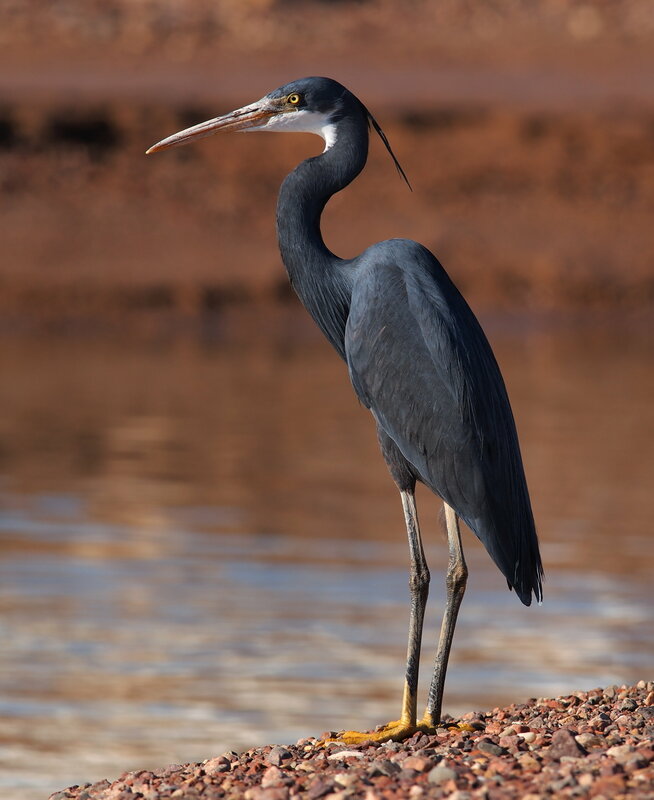 Western Reef Egret – click to enlarge. Seriously you should click! 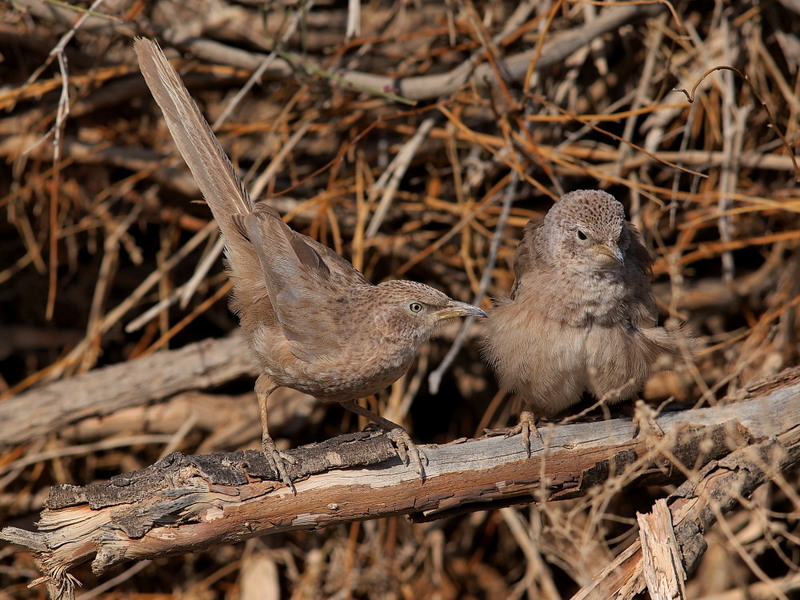 I woke up at 5.30 because I wanted to go to check the beach at Eilat before the days birding really started. Straited Heron is a regular visitor to the beaches of Eilat, but so far we didn’t have any luck locating it. I went to the beach, but I only found a Western Reef Egret and a lot of Red-eyed Gulls. And finally I found a spot where it was possible to get close to them. So I got some nice photos at last. 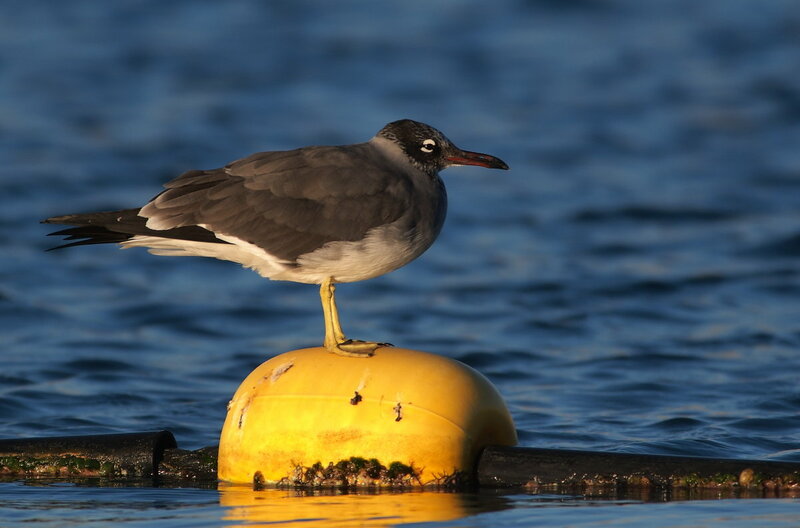 Red-eyed Gull in winter plumage. 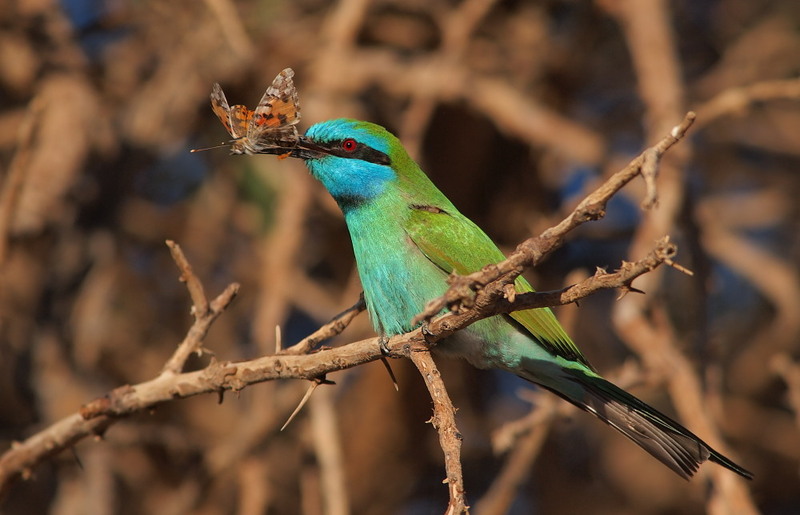 After coming back to Arava Hostel were we had stayed (a nice and cheap place in Eilat) we had some breakfast and then we headed to meet with Itai Shanni – leader of Eilat Bird observatory – as he had promised to take us to some places around Eilat. We met with Itai and got a lot of valuable information. For instance he finally helped us see a Straited Heron at the Dolphin Reef Resort. Otherwise there were not many birds around. 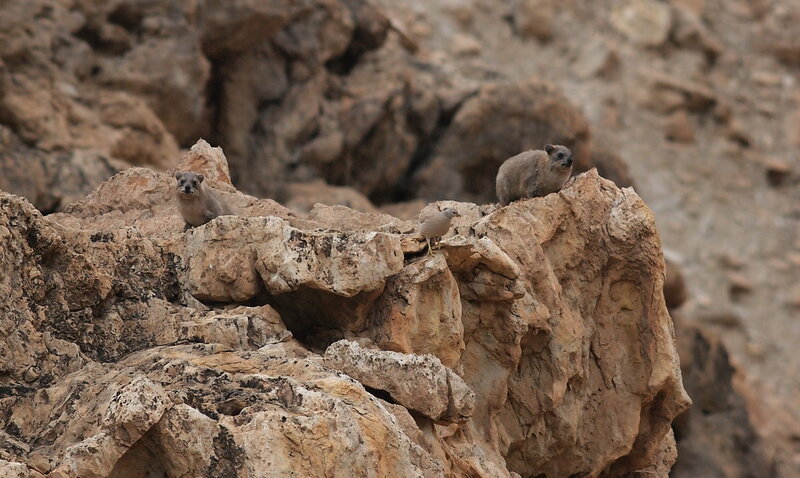 Itai has not seen so much rain in Eilat in 15 years and it really has changed the rules of engagement when it comes to the desert species. Now the birds don’t come to drink or stick to a specific green spot, because there are green spots and water all over. The highligt of the day came in the afternoon where we found two Arabian Warblers in some Acasia-scrub just south of Yotvata. It is really a nice and big sylvia – and a lifter! 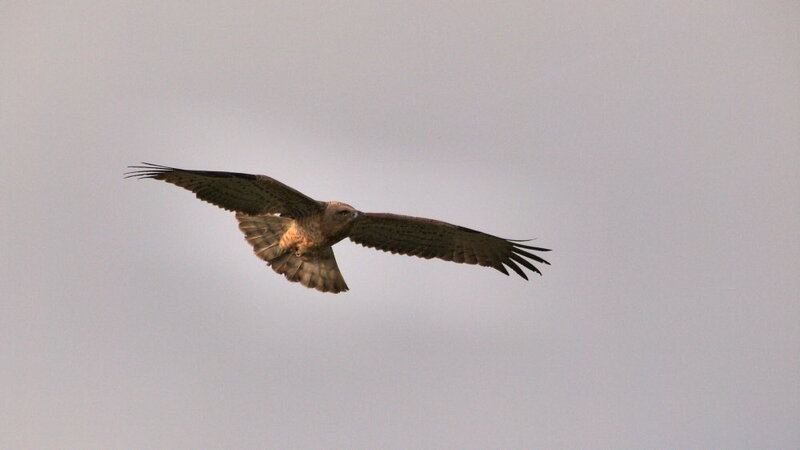 But it is not an easy bird as it tends to disappear for a long time. In the evening we had another try at the Egyptian Nightjars and while looking for them a Pharaoe Eagle Owl flew over our head. 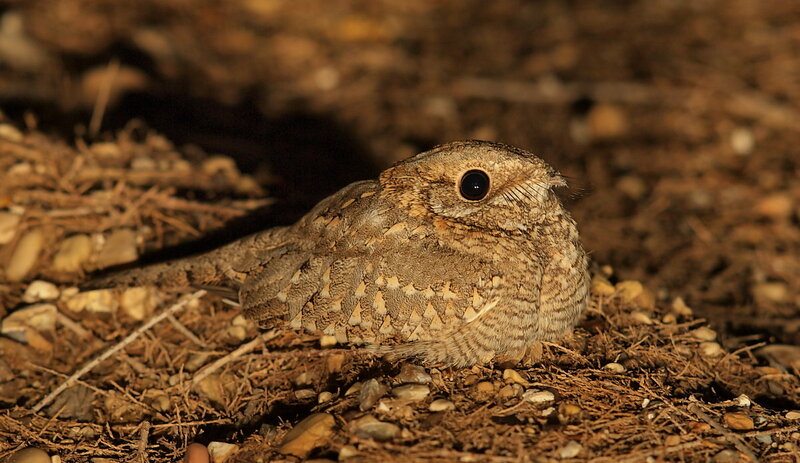 We didn’t get any photos, but the Egyptian Nightjars were quite cooperative. 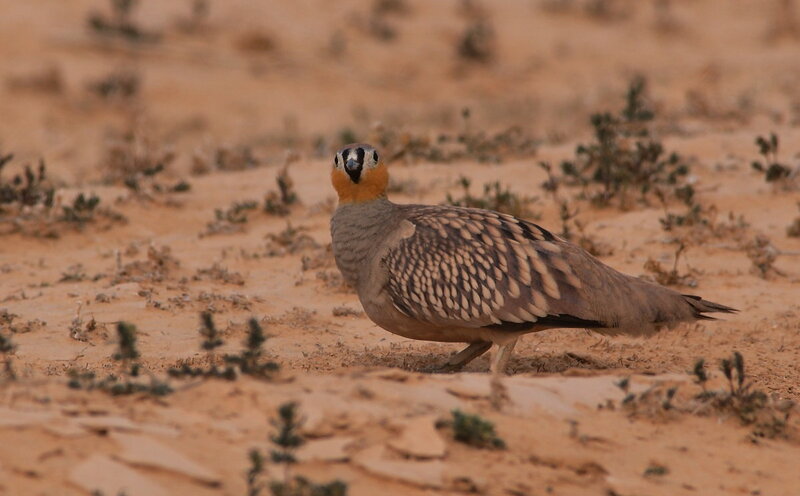 We woke up very early in order to find larks and other birds at Meishar – a plato i the Negev Desert. The rain had stopped, so desert birding was again possible. 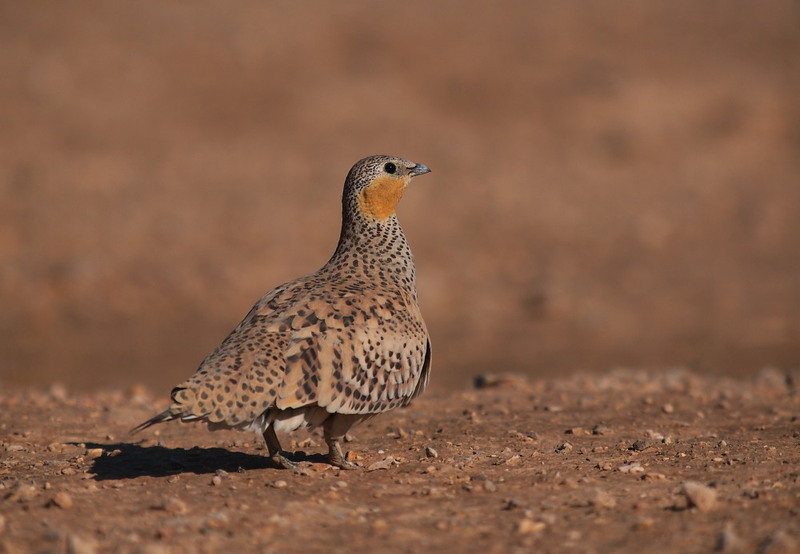 It didn’t take us long to see several flocks of Spotted Sandgrouse. We decided to get better views of these stunning birds. Mostly it is not easy to get close to such birds, but we had a lot of luck today – eventually we got the see them down to a few meters distance. But the larks were our primary target, but there was not much to see. Maybe it was due to the rain in the past days. But after a while we same some movement in a bush and seconds later we enjoyed supreme views of two Asian Desert Warblers. Without looking specifically for them we saw four different birds during the day. A little later Emin spotted a small bird on the ground. 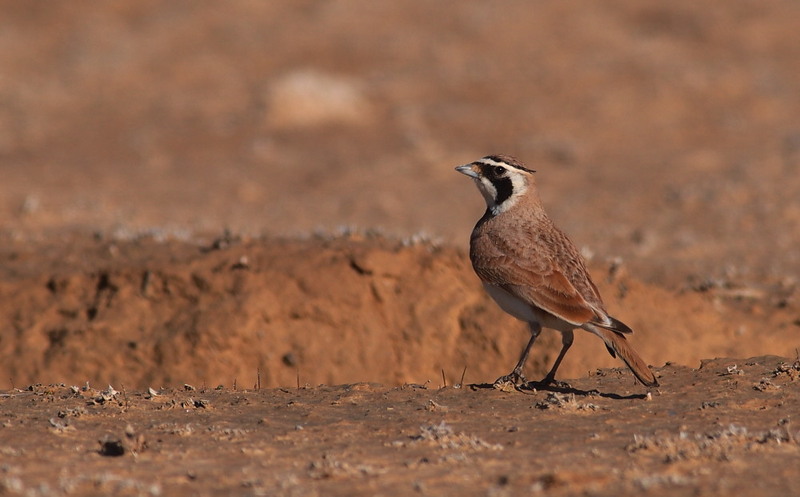 As we got closer no less than 5 Temminck’s Larks were foraging on the ground – finally the first target-lark was found. 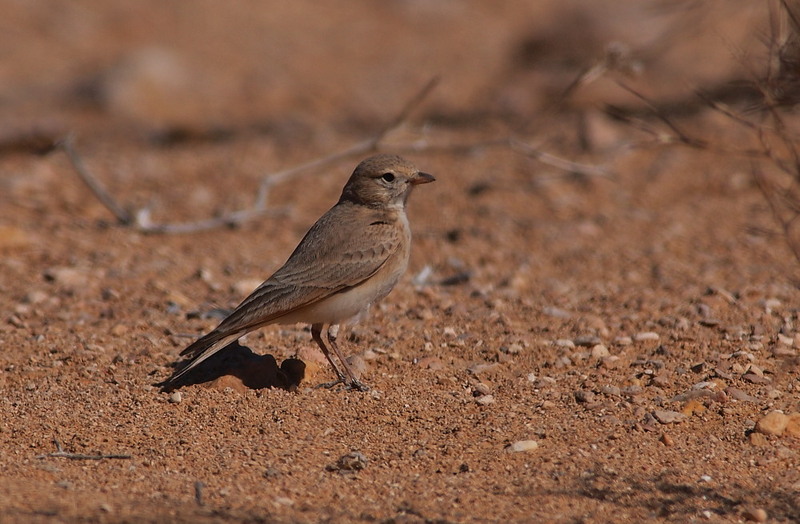 And the good luck continued as we found first one and then several Bar-tail Larks – our second target-lark. But we really couldn’t find more gold at Meishar. So we went south to Yotvata. 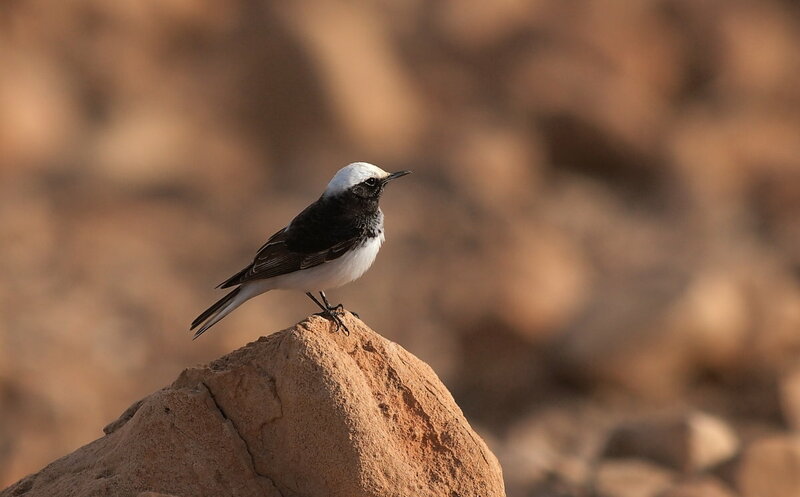 On our way there we saw a male Hooded Wheatear, but upon arrival we didn’t find neither Oriental Skylark or Hoopoe Lark. 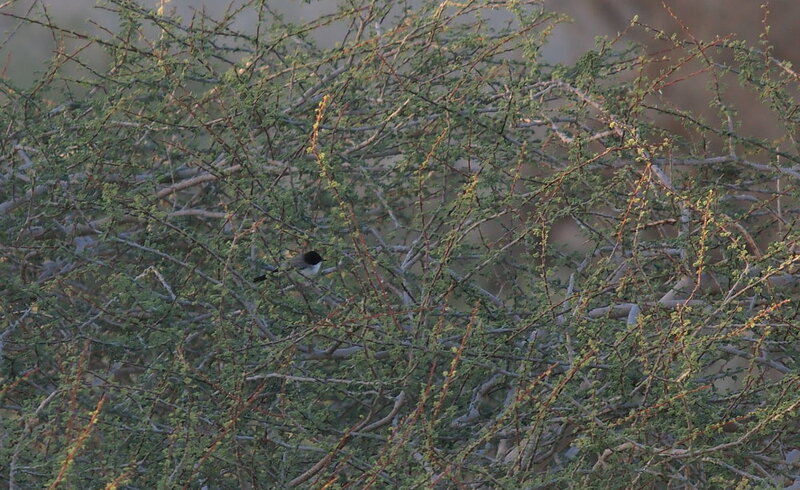 But we decided to stay untill after dusk in order to see a Pharaoe Eagle-Owl that is possible in the area. 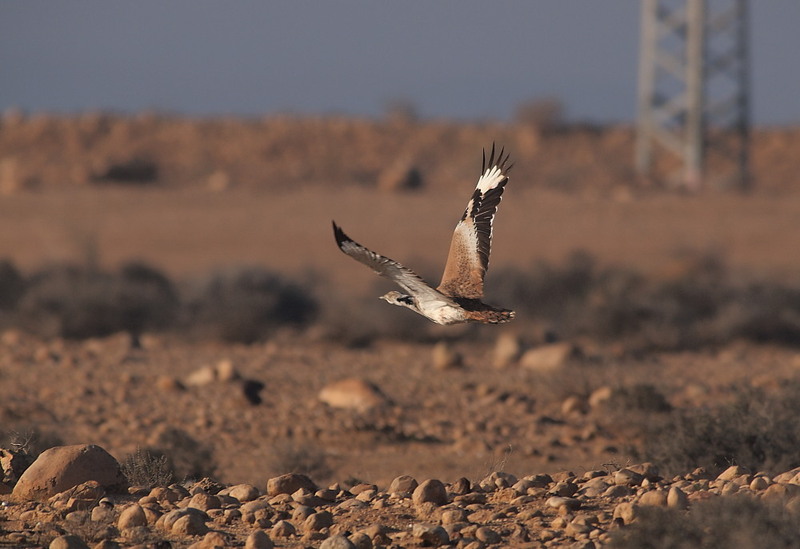 The Pharaoe Eagle-owl didn’t appear, but after a while Emin located some nightjars. We managed to get good views and eventually we got some bad pictures. 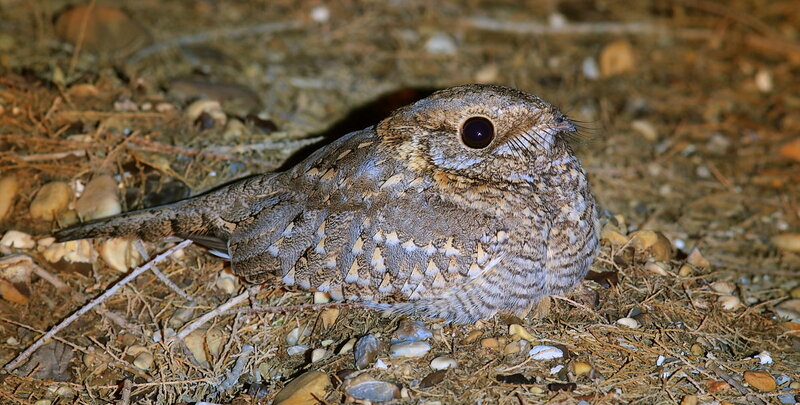 Pale underwing, pale appearance – wow, they were Egyptian Nightjars. A lifer for both of us. 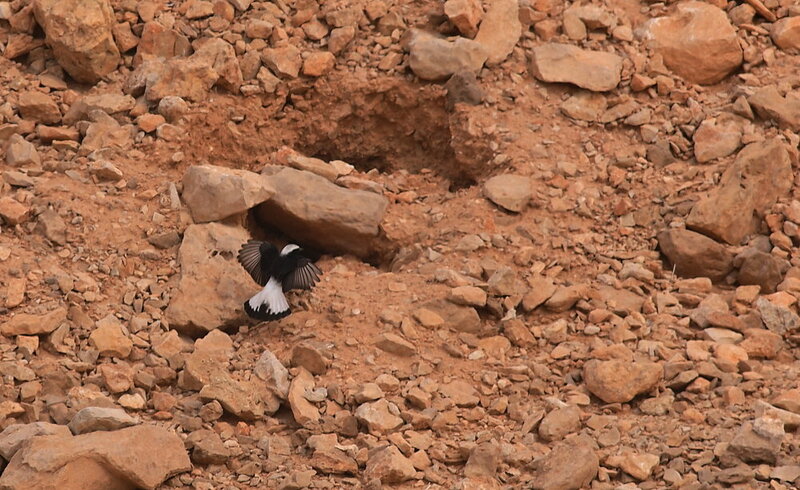 And a real surprise as they according to local israeli birders are “really rare” before march. A nice surprise no matter what! All the rain in the south made us change our plans and go north to Nizzana and Ezuz – an area know for its MacQueens Bustards. 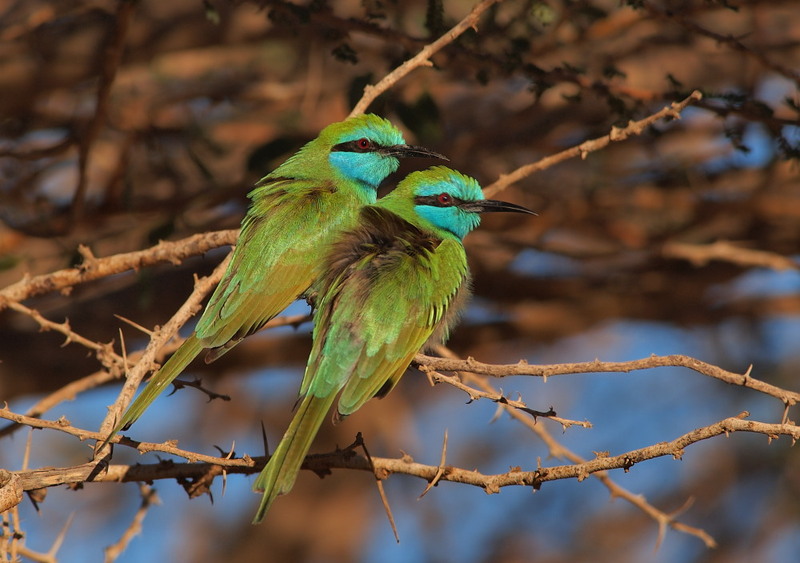 Israeli birders have been extremely helpful in the process of planing and helping after arrival. And at Nizzana local birder Shachar Alterman took us out. Actually he told us to meet at a certain point on the Nizzana – Ezuz road (near a fallen water tower). We arrived a little before him around 6:30 in the morning and 3 minutes later I spotted a MacQueens Bustard dancing east of the road. 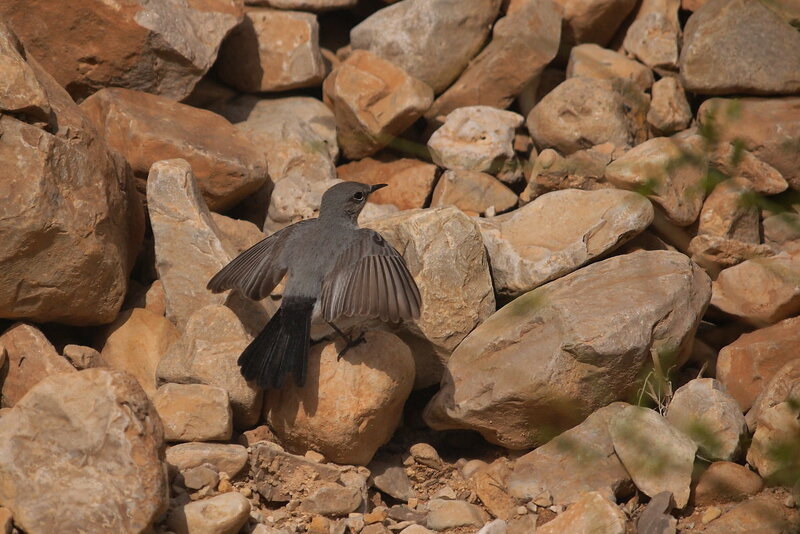 Shortly after Shachar arrived and we enjoyed prolonged views of the bird while it was dancing. Is was not within photo distance relly, but it was really special to observe the dancing through the scope. While watching the bustard about 150 Spotted Sandgrouses flew over. 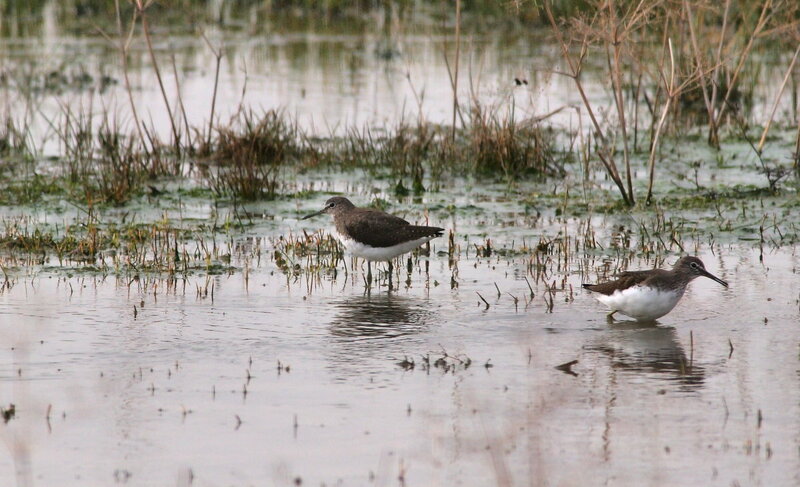 So after enjoying the bustard for about an hour we went to some sewage ponds, where the sandgrouses use to drink. But as there is fresh water all over due to the recent rain no birds came in. 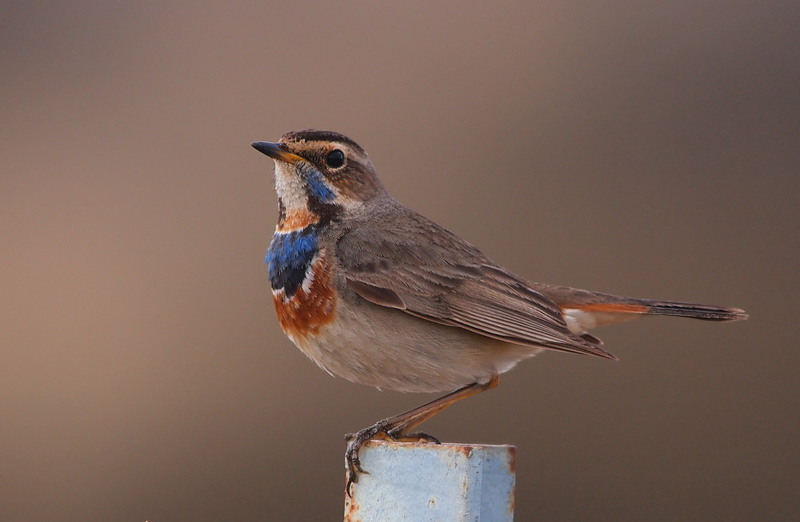 We only saw some Bluethroats (a male gave supreme views), some Chuckars and a Southern Grey Shrike. 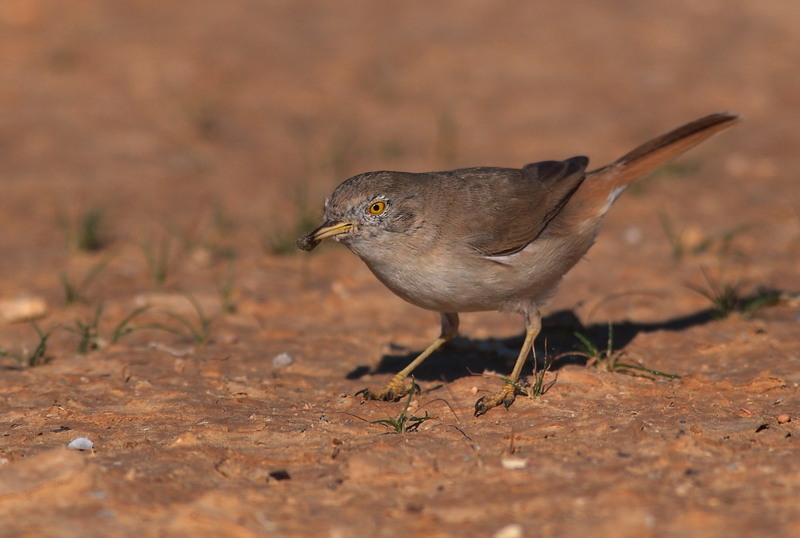 After that Shachar took us around the area and both Emin and I got Arabian Babbler as a lifer as a family gave really put on a show in a wadi. 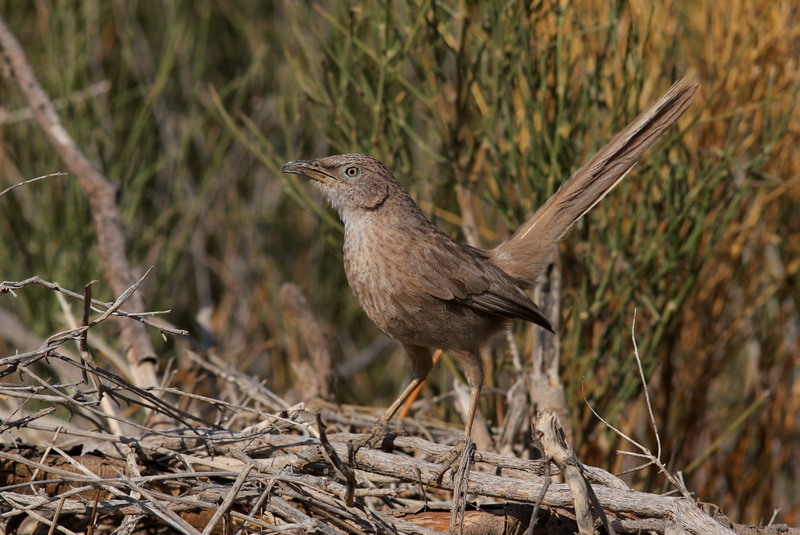 Arabian Babbler – ad. and juv. 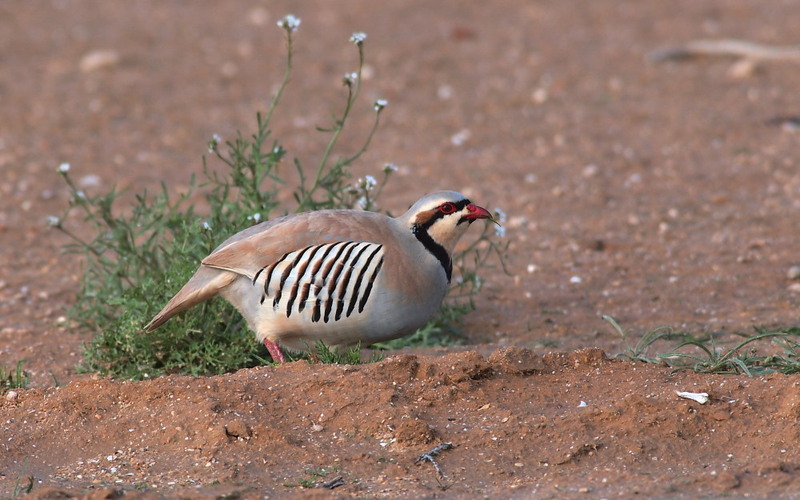 Other good birds include Great Spotted Cuckoo, Little Owl, Speckled Warbler, Palestine Sunbirds, Little Green Bee-eaters and the best Chukars that I have ever seen. 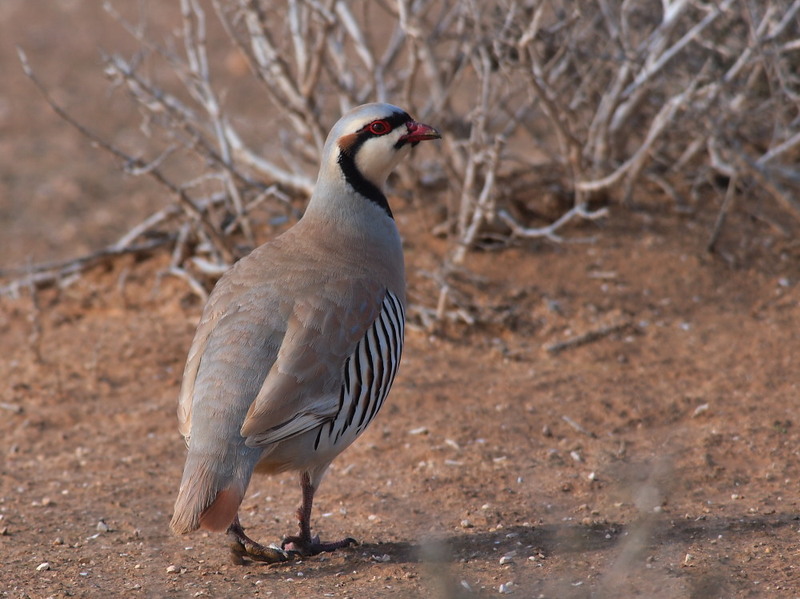 Chukar – note the ear tufts! All in all a fantastic day – and thanks for helping Shachar! 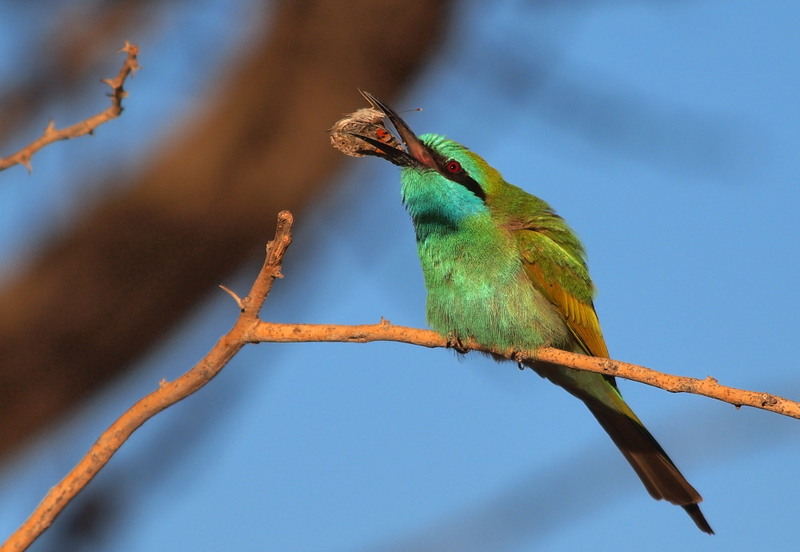 Little Green Bee-eater – I never get tired of this one!